UPDATE: Ms. Gideon will be charged with 6 additional counts of Vandalism including the damage to the Boston Police Relief Association Memorial located at Mount Hope Cemetery. At about 7:20 PM on Wednesday, April 10, 2019, officers assigned to District C-11 (Dorchester) responded to a radio call for a vandalism in the area of 2223 Dorchester Avenue (Saint Gregory’s Church) in Dorchester. On arrival, officers spoke to the victim who stated that an unknown individual had defaced the religious statue on the church’s property, covering the statue in an unknown red substance. The victim stated this is the fourth incident in which the statue had been vandalized in the past month with the same red substance being poured on the statue. Officers searched the area for a suspect to no avail. At about 8:30 AM on Monday, March 11, 2019, officers assigned to District E-18 (Hyde Park) responded to a radio call for a vandalism in the area of 25 Maple Street (Most Precious Blood Church) in Hyde Park. On arrival, officers spoke to the victim who stated he observed an unknown red substance on a statue on the church’s property. The victim further stated that he observed the same red substance on a bench in front of 90 West Milton Street in Hyde Park (Saint Anne’s). Officers searched the area for a suspect to no avail. At about 8:25 AM on Wednesday, March 13, 2019, officers assigned to District E-18 (Hyde Park) responded to a radio call for a vandalism in the area of 90 West Milton Street (Saint Anne’s Church) in Hyde Park. On arrival, officers spoke to the victim who stated that he observed an unknown red substance on a statue in front of the church, similar to the substance he had previously located on a bench in front of the church as well as on the side of Most Precious Blood on March 11, 2019. The victim further stated a parishioner notified him of a prior, unreported incident in which an unknown black female entered Most Precious Blood Church during closing and attempted to spray an unknown substance on the statues inside of the church. The unknown female, when confronted, stated that she was just praying before exiting the church and leaving the scene in a white sedan. The Boston Police Department is actively reviewing the facts and circumstances surrounding these incidents. Anyone with information is strongly urged to contact the Boston Police Civil Rights Unit at (617) 343-4527. On Monday, April 01, 2019 at 9:30 PM, officers assigned to the District E-18 (Hyde Park) Drug Control Unit, executed a search warrant in the area 24 Woodgate Street, Mattapan and arrested the target of their investigation, Joey Delossantos, 19 of Mattapan. As a result of the warrant, the following items were recovered: More than 62 grams of Fentanyl, 170 grams of an unknown white powder, $1400.00 in US currency and drug paraphernalia. Delossantos was charged with Trafficking: Class A, Drugs (Fentanyl), and Possession with intent to Distribute Class B, Drugs (Oxycodone). He will be arraigned in Dorchester District Court. ARREST MADE: At about 9:05 PM, on Monday, October 8, 2018, officers assigned to District E-18 (Hyde Park) responded to a call for an armed robbery in the area of 20 Prescott Street in Hyde Park. On arrival, officers spoke with a pizza delivery driver who stated that he had made contact with a customer via cellphone who indicated he would meet him at the above address to receive his food order. The victim stated that when he went to hand the food over, the male party pulled a firearm from his jacket pocket before pointing it at the victim while demanding the food and valuables from the victim. The unknown male suspect then fled the area on foot with the food and an undisclosed amount of cash. District detectives conducted a lengthy investigation which then led to the issuance of an arrest warrant for a 19-year-old male from Hyde Park. At about 1:30 PM on Friday March 1, 2019, members of the Boston Police Fugitive Unit located and arrested the male suspect without incident in the area of 1823 Hyde Park Avenue in Hyde Park. Investigators later recovered a black Daisy Powerline BB gun from the suspect’s residence. The suspect has since been arraigned on an Armed Robbery charge in West Roxbury District Court. This morning the Boston Bruins BFit visited the Sacred Heart School in Roslindale. BFit’s mission is to encourage movement and promote healthier living throughout New England. The Boston Bruins pledge to use their expertise in professional strength & conditioning, nutrition, and physical therapy as a platform to bring fitness to everyone. The Boston Police Community Engagement Unit was also present to talk to the kids about bullying and to reinforce how important it is to be kind to one another. BPD Officers Arrest Suspect Wanted in Connection to Armed Home Invasion in Hyde Park: At about 3:20 PM on Saturday January 12, 2019, officers assigned to District E-18 (Hyde Park) responded to a call for a suspicious vehicle parked in the middle Neponset Avenue near Loring Street in Hyde Park. On arrival, officers observed a vehicle matching the given description idling in the middle of the street with an unknown male standing next to it. Upon seeing the officers, the unknown male, later identified as Thiago Oliveira, 28, of Hyde Park, quickly entered the vehicle and sped away. The officers broadcast a description of the fleeing vehicle while continuing their investigation. Officers soon discovered that the door of a nearby residence appeared to have been kicked open. Officers spoke with the occupant of the apartment, an adult male, and learned that Oliveira, who was known to him had forced his way into the apartment and threatened him with a silver and black firearm. The suspect attempted to shoot the victim multiple times during the confrontation but his weapon malfunctioned. ARREST MADE: At about 2:10 PM on Monday, December 17, 2018, officers assigned to District E-18 (Hyde Park) responded to a radio call for a breaking and entering at a residence in the area of Summit Street in Hyde Park. On arrival officers located two males matching the description of the suspects who had just broken into a residence in the area. Officers spoke to the victim who stated he had arrived home and observed the two male suspects approach his front door and ring the bell. The victim, who remained inside his motor vehicle, stated the suspects did not get an answer at the front door so they moved to the side door of the residence, again ringing the bell and knocking on the door. The victim stated he observed the suspects gain entry into his enclosed sunroom through the side door. The victim stated at this time, he exited his vehicle and drew the attention of the suspects. The suspects exited the victim’s residence and immediately requested the victim’s energy bill information and his account number. The victim stated while the suspects were speaking to him, he observed his garage door to be partially open as well. The suspects eventually left the victim’s residence and proceeded to other residences in the area before police stopped them. The suspects stated they were both employees of “Spark Energy.” Both males were taken into custody. ONE LESS GUN: At about 6:30 PM on Saturday, November 3, 2018, officers assigned to District E-18 (Hyde Park) responded to a radio call for a drug investigation in the area of 20 Thorn Street in Hyde Park. Upon arrival, officers observed three males inside of the basement of the residence who immediately fled upon seeing officers. Officers were able to stop two of the males in the area of 731 River Street. Officers recovered a black Bernardelli .22 caliber firearm loaded with two rounds of live ammunition in the immediate area. Officers arrested Fredly Charles, 23-years-old, of Hyde Park and charged him with Unlawful Possession of a Firearm and Unlawful Possession of Ammunition. Charles is expected to be arraigned in West Roxbury District Court. 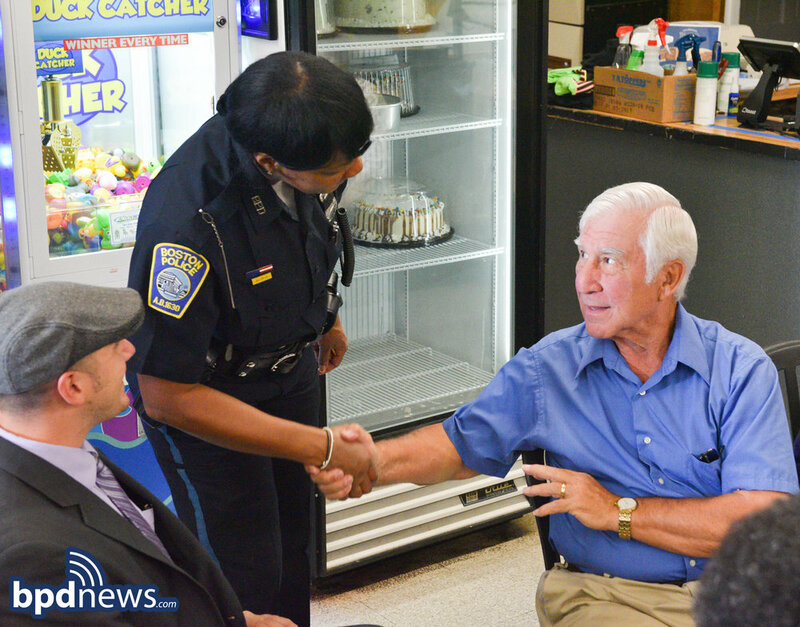 COFFEE WITH A COP: Earlier today, on Wednesday September 26, 2018, Coffee with a Cop stopped by Ron’s Gourmet Ice-Cream in Hyde Park. Thank you to everyone who came by to say hello to our officers from District E-18 while sharing a cup of coffee with friends and neighbors. Special thank you to the friendly staff at Ron’s for making everyone feel welcome and thank you to Representative Angelo Scaccia and City Councilor Tim McCarthy for stopping by. If you are interested in learning about starting a Neighborhood Watch Group or interested in attending a future Coffee with a Cop event please call (617) 343-4345. Come Join Us for Coffee with a Cop Tomorrow in Hyde Park! INCIDENT #1: At about 5:37 PM on Saturday September 8, 2018, officers assigned to District E-18 (Hyde Park) arrested Dwayne Leaston-Brown, 28, of Brockton, on firearm related charges during an investigation in the area 1617 Blue Hill Avenue in Mattapan. An officer was on routine patrol when he observed the suspect running down the street in a full sprint with one hand secured in his right front pants pocket. As the officer continued to observe, the suspect fell unexpectedly at which time a firearm dropped to the ground in front of him. The officer quickly moved in and placed the suspect in custody while safely recovering the weapon which was determined to be a loaded 9mm Kahr Arms CM9 handgun. Additional responding units arrived on scene and continued their investigation which led to the recovery of a second firearm, a loaded 9mm Glock 43 handgun, from a nearby trash can which has since been turned over to the Boston Police Firearms Analysis Unit for processing. The suspect will be arraigned in Dorchester District Court on charges of Unlawful Possession of a Firearm, Unlawful Possession of Ammunition, Carrying a Loaded Firearm and Armed Career Criminal (Level 2). INCIDENT #2: At about 2:56 AM on Sunday September 9, 2018, officers assigned to District B-2 (Roxbury) arrested Glenroy Miller, 22, of, Roxbury, on firearm related charges during a traffic stop in the area of American Legion Highway and Blue Hill Avenue in Dorchester. Officers were on routine patrol when they observed a motor vehicle travelling at a high rate of speed with no headlights illuminated. Officers soon caught up to the vehicle and stopped it at which time they removed the front seat passenger, later determined to be Miller, after they observed him behaving in a suspicious and agitated manner. As officers began to perform a pat frisk, they immediately felt a handgun on the suspect’s left thigh area. A violent struggle then ensued as the officers and the suspect fought for control of the weapon. Officers were eventually able to place the suspect in custody at which time they recovered a loaded 9mm Smith & Wesson M&P Shield handgun with a defaced serial number. The suspect will appear in Dorchester District Court on charges of Unlawful Possession of a Firearm (2nd and Subsequent), Unlawful Possession of Ammunition, Carrying a Loaded Firearm, Possession of a Firearm with an Obliterated Serial Number and Resisting Arrest. UPDATE: Missing Person Diante “Kai” Davis-Copeland, 22, of Hyde Park has been located safe and sound. To all who helped in the search, we say, "Thank you." The Boston Police Department put out an earlier missing person advisory seeking the public's help in efforts to locate 22-year-old Diante “Kai” Davis-Copeland of Hyde Park who was last seen at about 3:00PM, on Sunday, August 12, 2018, in the area of Fairmount Avenue wearing a black hoodie, black jeans, white sneakers with a black backpack. Mr. Davis-Copeland has had a history of wandering off and has been reported missing before. Thankfully, he again was found safe and sound and we thank all those who reached out to District E-18 (Hyde Park) Detectives with information relative to his whereabouts. 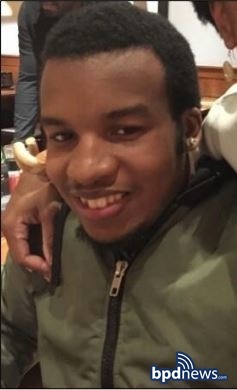 MISSING PERSON ALERT: A Missing Person Alert has been issued for Diante “Kai” Davis-Copeland, 22, of Hyde Park: The Boston Police Department is seeking the public's help in efforts to locate 22-year-old Diante “Kai” Davis-Copeland of Hyde Park who was last seen at about 3:00PM, on Sunday, August 12, 2018, in the area of Fairmount Avenue in Hyde Park wearing a black hoodie, black jeans, white sneakers with a black backpack. Diante is described as a black male, 5’08” with a slim build and a full beard. Mr. Davis-Copeland has gone missing in the past and has been known to frequent the Hyde Park Library and the areas surrounding Hyde Park High School. Anyone with information relative to his whereabouts is urged to call District E-18 Detectives at (617) 343-5607. NATIONAL NIGHT OUT: The 35th Annual National Night Out Boston, a 2-day citywide celebration that will visit 12 individual neighborhoods across the City of Boston over a 48 hour period, kicks off tomorrow, Monday, August 6, 2018 and concludes Tuesday, August 7, 2018. For those not familiar with National Night Out, it's an acknowledgement and national celebration of the partnerships that exist between communities and police departments all across the country. As in year's past, Mayor Walsh will be travelling all over the city to thank community members and Neighborhood Watch Groups for their help and support of the men and women of the BPD. A motorcade of officials led by Mayor Martin J. Walsh and Commissioner William G. Gross will be visiting six designated sites per evening for community crime watch celebrations — one in each police district. Along every stop, awards will be presented to the Top Crime Watch Group in each neighborhood and the Crimefighter of the Year (an individual for their year-round efforts in assisting the Boston Police Department). Residents of Boston and members of the Boston Police Department will enjoy free admission, food, games, and entertainment. Attendees are invited to visit sponsor tables including The Boston Police Foundation, Suffolk County Sheriff’s Department, Boston Centers for Youth & Families and a host of others, including local non-profits, who have worked so hard to make this event the special occasion it has become. EVERY BOSTON RESIDENT IS URGED TO SWITCH ON THEIR OUTSIDE LIGHTS FOR THE EVENINGS TO DEMONSTRATE OUR UNITED COMMUNITY EFFORT AGAINST CRIME. At about 4:24 AM on Sunday, July 22, 2018, officers assigned to District E-18 (Hyde Park) responded to a call for two people shot in the area of Osceola Street and Hopewell Road in Mattapan. On arrival, officers located two adult male victims suffering from apparent gunshot wounds. One victim was transported to an area hospital with non-life threatening injuries while a second victim believed to be in his late twenties, suffering life threatening injuries, was transported to an area hospital where he was later pronounced deceased. The victim has since been identified as 28-year-old Dahrius Hollins of Hyde Park. At about 4:24 AM on Sunday, July 22, 2018, officers assigned to District E-18 (Hyde Park) responded to a call for two people shot in the area of Osceola Street and Hopewell Road in Mattapan. On arrival, officers located two adult male victims suffering from apparent gunshot wounds. One victim was transported to an area hospital with non-life threatening injuries while a second victim believed to be in his late twenties, suffering life threatening injuries, was transported to an area hospital where he was later pronounced deceased.